An Interview with Yusuke Yamatani by James Bugg & Kristian Haggblom. Into the Light is the most recent publication by Yusuke Yamatani. In this interview he outlines his inspirations for the work, which vary from fatherhood to playing punk music. He expands on the idea of 'seeing' and 'being seen', as well as the work's connection to shishashin, referred to i-photography. Yusuke-san, your recent publication Into The Light by T&M Projects is an incredibly beautiful, yet equally haunting perspective of suburban Tokyo. Can you tell us about the motivation and ideas behind this work? I got married in 2014 and published my honeymoon in Japan as RAMA LAMA DING DONG. Then my child was born in October 2015. It was a very spectacular experience and it was a pleasure, but when I became a father I also felt somewhat puzzled by the situation, something I had never experienced. Occasionally, I left my wife and the house when my child was crying at night to take a walk and get away from home. 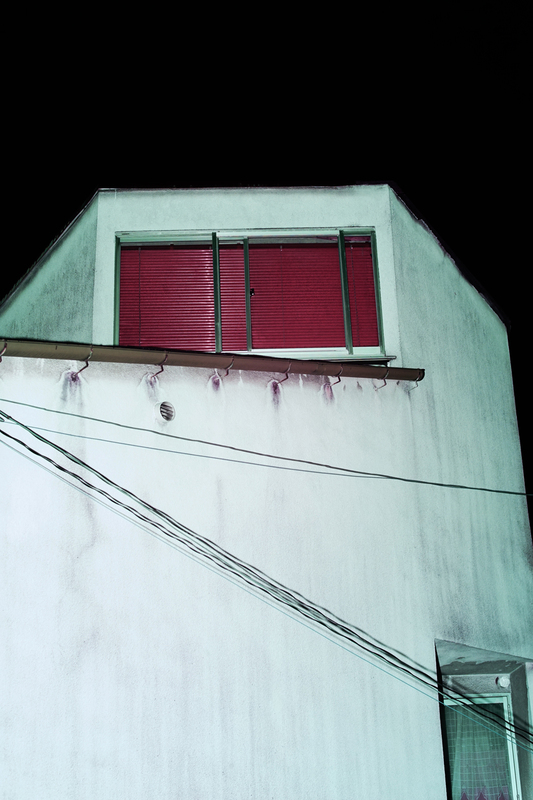 While walking around the residential area in the evening, I became interested in other people's houses and lives inside and this is when I started shooting this series of infrared photographs. The use of infrared photography creates a very distinct language throughout the book and I feel I am observing someone else’s memories or dreams. What was the idea behind using the infrared technique for this work? And were there any technical challenges? My interest in the homes of others led to the desire to look into the house and how other families functioned inside their homes and this led to the use of an infrared camera. 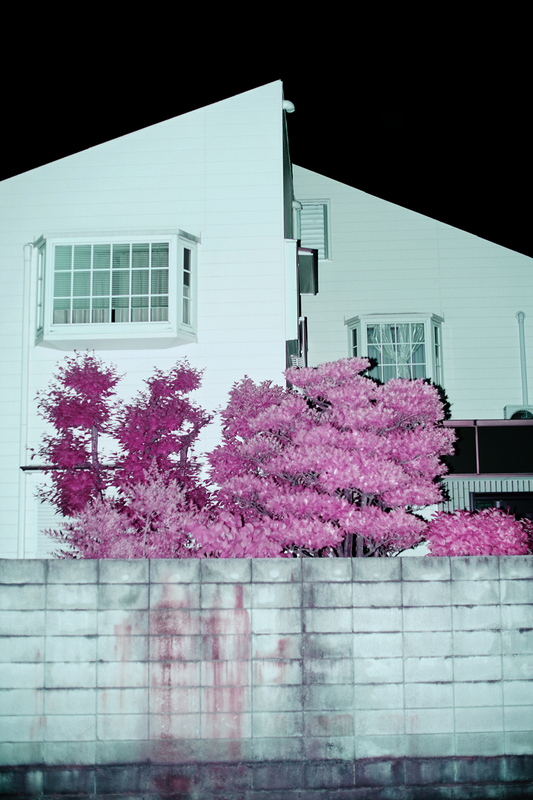 Even with the use of an infrared camera that responds to invisible rays, we cannot, of course, take a peek into these houses. The desire to have a glimpse into other human activities is impossible through walls and in turn this made me strongly aware of “seeing” and “being seen.” The work is an attempt to depict relationships we have with the people we live in close proximity with in larger modern internet society, a sense of that relationship rather than seeking permission from residents to enter their homes. Technically, infrared film didn’t initially work for my intentions, so there was some trial and error used to remodel a digital camera for my purposes. The photographs are largely consumed by darkness. This is a theme that is also evident in some of your previous works such as Tsugi no yorue and aspects of RAMA LAMA DING DONG. What draws you to photograph the night? I like the night. In my life, most of my precious time is spent at night. So, I have been using flash frequently from the early days. Taking pictures with a flash is close to robbing the scene. The act of photography inherently has a violent aspect. Many of the things in the world are being blurred so that we do not have the feeling of pain as we are living. Night has darkness. I want to reveal the inside of that invisible darkness with the flash and to reveal the usually hidden. Into The Light uses photographs of the urban landscape punctuated by portraits of seemingly unsuspecting characters. Are you able to give us insight into who these characters are or at least the idea behind their inclusion in the work? People appear suddenly as silent houses emerge in the darkness by flash. This is exactly my experience. People are unexpectedly present even at 2:00 AM, people who are on their way home, people just sitting in the park, drunk, etc. I do not talk with these people, but there is silent communication. The residential area at midnight is very quiet. It feels like I do not think there are people other than myself in this world. Among them, I felt fear, tension, and peace of mind and I hope that is evident in the images. The title of the book Into The Light comes with connotations of life and death but also juxtaposes the prominently dark aesthetic of the work. Can you talk us through the reason for the title and how the work relates back to the idea of Tsuka? I felt some fear when shooting these houses at midnight. The houses had a smell of death. I felt that I wanted to transform the houses into boxes, like tombs. Like a Tsuka monument, they take on monumental meanings associated with death. However, these houses are inorganic, houses continue to change with the residents and can not be separated from human activities. The house is a memory, giving the residents the method of coexisting with nature, the rhythm of life, the standard of various aesthetic sensibilities. When I looked back over the photographs carefully, I felt I had captured a little of the occupant’s atmosphere from their home. This is where the title Into the Light came from. The work of Kohei Yoshiyuki seems to be a clear influence on this body of work, are there other artists that you have drawn inspiration from or continue to inform your practice? It still fascinates me that when Yoshiyuki first showed those photographs the gallery was pitch black and the visitors used torches to actually view the work. Regarding Kohei Yoshiyuki's work, it was technically and historically very helpful and inspiring. As well as Yoshiyuki, there is another Japanese photographer worked with an infrared camera in the 1980s, Ikko Kagari, and he is also a great inspiration. For Into the Light, these photographers techniques and styles are similar, but they are approaching completely different ideas. Now we can peer into others' life very easily via the net. In the post-truth era, I feel some terror from what is often called the civil surveillance society. I took advantage of the characteristics of infrared camera to ‘peep’ much like Yoshiyuki and Kagari. Wolfgang Tillmans' work and how he represents the world, especially in large-scale exhibitions, always stimulates and inspires me. You seem to use many different photographic ‘styles’ and switch methodologies for each project. This is also extended in to the experimental installation of your work. Is this a tactic you have purposely adopted or does the research process direct the best medium and method for each project? It seems unnatural to me to always work with one style and I feel this method would hinder or create an invisible fence for my creative work. We live in a very complex society and it is also complex to take snapshots in the street and this extends to photographing models and the relationships that are involved. It may be more difficult for photographers to take pictures these days, however, I do not think that I can just do photography at home or in my head, I need to engage with the world. I consider my practice as a kind of elementary stance, I enjoy taking pictures and discovering the world that we have not seen at all through photography. I am not particularly interested in technique but rather logging and accumulating viewpoints I have gained while living my life and recording it. So in a sense, I may be following the genealogy of Shishashin* (i-photography). I have read that before you started taking photographs you played in punk bands? Does music inform your work? And how? What is the soundtrack for this project? Music still gives me a lot of influence. Especially as I was all about punk in my teens, so that spirit is still influential to me - music taught me a way of life. As I have grown older, I have become more tolerant but my core has not changed greatly since my teenage years. I like how people with music background, in some random moments, shows their musical elements through gesture, attitude and atmosphere. These expressions also exist in street scenes and other simple things. I find photography is the most appropriate expression capture this and enable others to sympathise with your vision. Also, I think my photography is linked to playing musical instruments, in my case the drums. A kind of ‘rhythm feeling’ is what I always care about in my photographic production. The influence of external stimulus and internal rhythm such as the distribution of light and shade of monochrome, repetition of similar images, how to shift it unintentionally, etc. These influences and traits have come from music. In particular, this relationship to music is an important expressional method, like sequencing photographs there is a stream or compositional element that requires narrative which, for me, is accompanied by rhythm. What are your plans for the future and do you think you will continue your somewhat nocturnal approach to photography? I recently announced a new work that will be launched in Tokyo, it is a self portrait project. Through making Into the Light I was consciously mentally and physically of the acts of ‘seeing’ and ‘being seen’ and my own act of ‘taking’. The project will be a performance using a drum set and a newly invented camera device. A vibration sensor will be attached to the drum set and reacts to the tapping and triggers the cameras shutter and flash units. I intend inducing a transformative state by hitting the drum violently for a prolonged period. It is a self portrait work where I hope consciousness and unconscious will meet. In the darkness, it is so intensive or even violent in a way that an infinite number of flashlights are emitted as shutters are released. The flashlights are akin to our eyes in this informational world where truths and lies are intertwined so that it is representative of the approaches we take to hidden truths. I said that I like the night, but the main reason I like the night is because darkness covers and conceals the world. Many things that cause pain are also hidden are hidden. Ultimately, I want to look beyond a photogenic expression and explore what is hidden and not immediately visible. Lastly, can you share any links to hear the bands you played in? I am sorry, it is embarrassing and so I will refrain… haha! * The photographs in Sentimental Journey Araki function as the text of an ‘I-novel’ might, delicately stitching together the story of the artist’s relationship with a close other. He would later dub the technique shishashin, rendered in English as ‘I-photography’ or ‘personal photography.’ The form went on to become one of the important currents running through Japanese photographic expression.